THESE TAGS WAS STOLEN FROM ME AT THE 2008 MWGB! If you traded for it with anyone but me, please contact me. 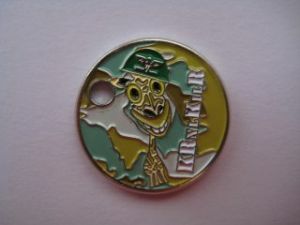 The "Bug-eyed" giraffe colonel is my geocaching trademark. He is the epitome of KRnlKilR. I had these tags made so I would have the opportunity to promote the social aspects of GeoCaching by meeting new cachers and having something in common. I do NOT wish to trade by postal mail except in extreme cases, (say you live more than 1000 miles from my home coordinates), and would prefer to always trade in person. If you would like to meet me and trade tags, you can attend any InKy event (inkygeo.com) to hit me up. I attend them all. I'm currently out of tags and will be reordering some more after the MWGB.